Hard Drive Adapter for SCA - 80 style drives. This connector allows use of lots of high end drives is Regular PC systems. 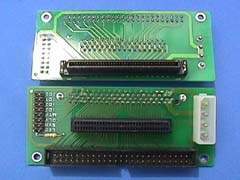 Has Both Ribbon cable Connectors SCSI IDC 50 and Ultra Wide Connectors. Additional information on board documentation.